Good morning ... “Hair ice” is thin, interlaced ice that forms in patches and looks more like wadded-up cheesecloth or, from a distance, maybe even toilet paper. It only forms in certain conditions and usually melts at sunrise, but a park ranger in South Carolina was fortunate enough to capture some photos of this wonderful phenomenon. 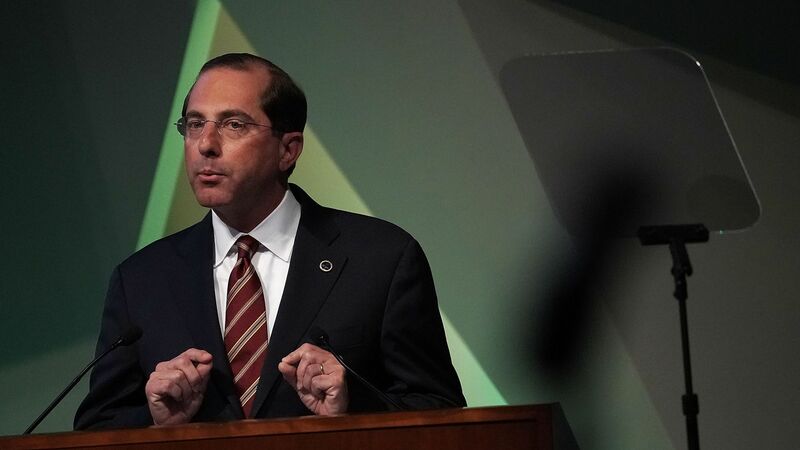 HHS' new report about ways to improve “choice and competition” in the U.S. health care system is stuffed with plenty of standard conservative talking points. But a few interesting policies endorsed by independent experts are also tucked inside, Axios' Bob Herman reports. NJ.com raises a good point: New Jersey has done just about everything it can to counteract the Trump administration’s cuts to the ACA. Yet ACA enrollment is down by about 16% this year in the state. Between the lines: Enrollment is down across the board, compared to the same period a year ago. Some critics and commentators have attributed to drop to the Trump administration’s actions — including the nullification of the individual mandate; steep cuts to outreach and PR efforts; and the expansion of bare-bones “short-term plans” that could compete with ACA coverage. But New Jersey has done more than any other state to preserve the ACA’s intended structure. It has passed its own individual mandate; banned short-term plans; and gotten federal approval for a reinsurance program to reduce premiums. It has also, per NJ.com, spent more than $800,000 to promote enrollment this year. The bottom line: Trump’s anti-ACA moves have gotten a lot of attention, so it’s entirely possible some people in New Jersey don’t know they’re still subject to a coverage mandate. But even so, all of this still suggests that an individual mandate isn't super effective at getting people to enroll, and that short-term plans don't explain too much of the nationwide exodus — since neither of those factors is relevant in New Jersey. The first patent that Amgen filed for its arthritis drug Enbrel expired in 2010, but another slew of granted and active patent applications has extended the drug's market exclusivity through 2029, according to a new I-MAK report. About three-fourths of the 57 patent applications were filed after Enbrel won FDA approval in 1998. Between 2012 and 2016, average per-person annual Medicare spending on Enbrel doubled — from $16,828 to $32,891. Total Medicare and Medicaid spending on Enbrel increased 129%. Why it matters: Extending a drug's patent protections is a way for drugmakers to keep competition off of the market. Patent protections give drugmakers an incentive to spend time and money developing new drugs. Companies do so knowing they'll have the opportunity to recoup that money through market exclusivity. But extending market exclusivity beyond the original patent — in this case, by an additional 19 years — means a drugmaker benefits from monopoly pricing for way longer than the law intends, costing both patients and taxpayers a lot of money. If you thought hospital consolidation would slow down, in the wake of concerns that consolidation raises prices, you were wrong. NYU Langone declined to comment further. But it’s pretty clear the system wants to gobble up more market share beyond the NYC metro area, which has been going on for the past several years now. Health care consultant and former journalist Michael Millenson flagged a detail I never knew about former President George H.W. Bush: He once appeared to endorse a Medicaid buy-in proposal. "One thing I will not do is sock every business in the country and, thus, throw some people out of work ... What I will do is permit people to buy into Medicaid. I believe that's the answer. " That appears to be the beginning and end of Bush's support for such an idea, so this wasn't exactly a full-throated endorsement. Bush presented this as an alternative to Michael Dukakis' plan for an employer mandate — which the ACA later enacted. So, full-throated or not, it's still fascinating to go back and hear the conservative candidate mention an idea that sat dormant for the next 30 years, only to see new light on the heels of major progressive Democratic victories.